Caeli McCulloch, 16, of Halifax, will start an early enrollment program at Johnson and Wales University, in RI, as she finishes her senior year at SLRHS. Hard work has paid off in a sweet way for one exceptional Silver Lake student who has baked her way into early admission to culinary college. Caeli McCulloch, 16, of Halifax may have been born with a mixing spoon in hand as she has officially been accepted to Johnson and Wales University in Rhode Island as an early enrollment culinary student. Although she is only a junior at Silver Lake High School she will complete her senior course load next fall as a freshman at Johnson and Wales University in Johnston, Rhode Island, allowing her to complete college one year early. Her original goal in making and selling holiday confections was to save money for college as technically she doesn’t qualify for state financial aid until she graduates high school. 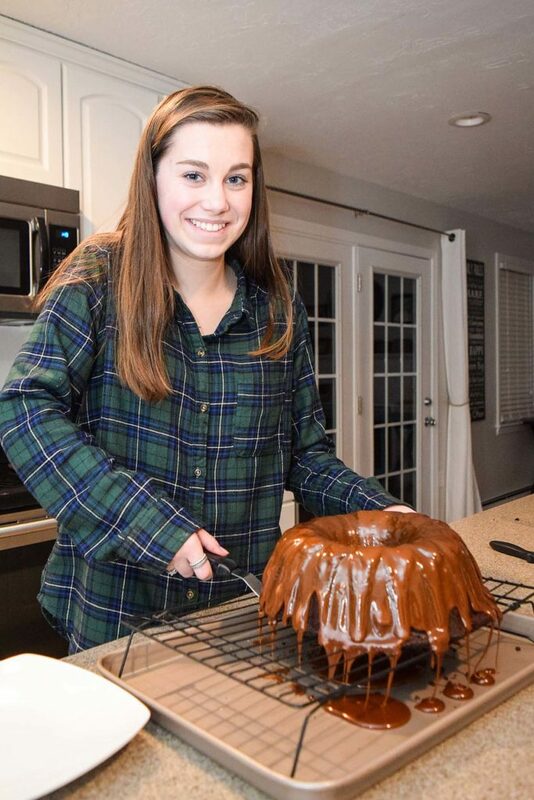 Caeli spoke with The Express while whipping up a recipe she referred to as ‘simple’ – a delectable chocolate bourbon Bundt cake -with a caramel glaze. She whisked the thickening caramel in a multi-task, carefree manner never losing track of her perfectly formed cake as she described her passion for pastry. Her busy holiday schedule included: working at her job of two years- Just Desserts in Bridgewater center, filling custom orders for holiday deadlines, keeping up with school work and daily chores. She also competes in track and field at Silver Lake. She took over the family’s oversized kitchen for baking and packaging holiday pies, hand making assorted dessert trays and for several days occupied the space until she finalized each order. She estimates she made 25 desserts for Thanksgiving and then completed another 25 orders for Christmas. With modesty McCulloch describes her above average grade point and perfect score of 100 percent in her culinary program through the Silver Lake Career and Technical Education Program. The early acceptance program was something she had in her sights since her freshman year. “It will be hard to let her go a year early to college but she has worked so hard. She has impressed me every step of the way,” said mom, Lynn Czarniak and step father Scott Czarniak. The family agreed that Caeli has always worked well under pressure and couldn’t be more proud. They recently learned she was awarded the Presidential Academic Scholarship through Johnson and Wales University, which will pay approximately half of her tuition. Her earliest kitchen recollections are using an EZ Bake Oven and kids cooking books, which were beneath her vast natural ability even at the age of four, according to mom. Eventually moving on to utensils and kitchen equipment with her mom they would cook together for her younger brother who had severe food allergies. Czarniak would cook specialized meals and with her daughter gained abundant knowledge on food allergens and how they could affect others. Caeli credits this early awareness towards her recent successes. Their home is nut- free so she was able to be aware of those special needs for several holiday orders. McCulloch proudly owns the title of ‘the person in charge of dessert’ when attending parties. She finds the structural aspect of baking to be an independent, natural, calming component in her life. Following online recipes using a base of a recipe then testing and personalizing to her own taste satisfies her creative flair. French macarons are a favored small plated pastry. She has mastered the ability of decorating party cupcakes, which has gained popularity over the years. In choosing what to make on her holiday menu she based desserts on what she has perfected through school and her bakery experience. “We learn about popular desserts and cultural awareness so I went on what I thought would sell the most- based on my previous knowledge,” she said. Caeil’s Creations were expounded on by word of mouth, as well as posted on the Halifax and Pembroke connect pages. A morsel of advice she would offer other teens in their endeavors is to never give up. “You can do whatever you think you can. I never thought I would be going to school a year early and do all this – school – managing my job and applying for college. Work as hard as you can, try everything to the best of your ability,” she said.